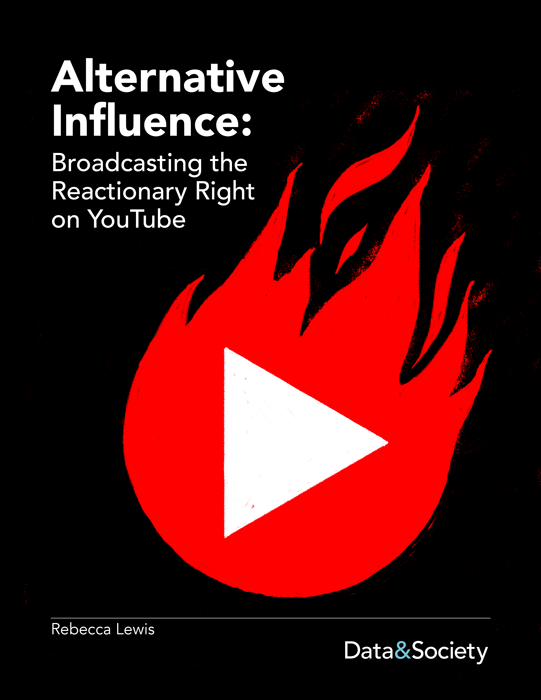 New Data & Society report Alternative Influence: Broadcasting the Reactionary Right on YouTube by Researcher Rebecca Lewis presents data from approximately 65 political influencers across 81 channels to identify the “Alternative Influence Network (AIN)”; an alternative media system that adopts the techniques of brand influencers to build audiences and “sell” them political ideology. Alternative Influence offers insights into the connection between influence, amplification, monetization, and radicalization at a time when platform companies struggle to handle policies and standards for extremist influencers. The network of scholars, media pundits, and internet celebrities that Lewis identifies leverages YouTube to promote a range of political positions, from mainstream versions of libertarianism and conservatism, all the way to overt white nationalism. Notably, YouTube is a principal online news source for young people.1 Which is why it is concerning that YouTube, a subsidiary of Google, has become the single most important hub by which an extensive network of far-right influencers profit from broadcasting propaganda to young viewers. “Social networking between influencers makes it easy for audience members to be incrementally exposed to, and come to trust, ever more extremist political positions,” writes Lewis, who outlines how YouTube incentivizes their behavior. Lewis illustrates common techniques that these far-right influencers use to make money as they cultivate alternative social identities and use production value to increase their appeal as countercultural social underdogs. The report offers a data visualization of this network to show how connected influencers act as a conduit for viewership. 1.Aaron Smith and Monica Anderson, “Social Media Use in 2018” (Pew Research Center, March 1, 2018), http://www.pewinternet.org/2018/03/01/social-media-use-in-2018/pi_2018-03-01_social-media_0-01/. "Social networking between influencers makes it easy for audience members to be incrementally exposed to, and come to trust, ever more extremist political positions." Does YouTube encourage its users to follow bread crumb trails to more extreme ideological content? How do these influencers establish credibility, relatability, and authenticity with their audiences? Which influencers aim to destabilize audience members’ world-views in order to turn them against mainstream media, in some cases encouraging them to openly embrace racism, misogyny, and white nationalism? How does the Alternative Influence Network interact with recommendation algorithms to surface extremist content, especially to young people? Who profits off these dynamics? Why has YouTube remained conspicuously absent from calls for platform accountability? How can we raise awareness of influencers’ top techniques, from SEO to strategic controversy, for building and radicalizing online audiences? This report is part of the Media Manipulation Initiative at Data & Society.